You are here: Home / Inspiration / Stop scrolling. 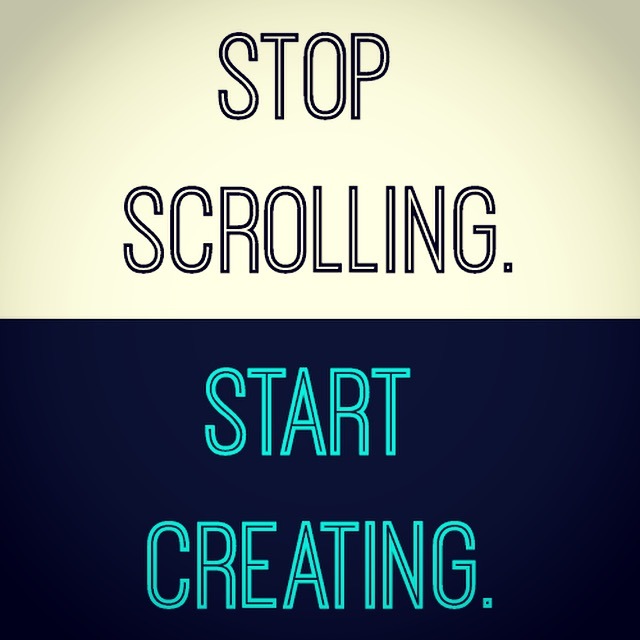 Start creating. All the amazing snapshots of everyone’s amazingness. It’s just too much, isn’t it? And yet, there we are. Again. And yet, I do it all the time. I scroll through 10 pictures on Instagram before I even realize I’m on it. I’m not thinking. I’m escaping. I’m looking to be distracted from my own life with snapshots of everyone else’s. We’re scrolling too much. And creating too little. We need to stop the constant comparison. The Obsessive Comparison Disorder. Don’t worry about everyone’s “success” on social media. There’s an ugly side to every amazing picture they’re posting. Focus on writing your own story instead of trying to live someone else’s. Instead of complaining about everything wrong with this world, let’s start creating something right.